The Allahabad High Court refused to grant police protection to a live-in couple on the ground that one of them is married to another person and the marriage has not been dissolved by any competent court as on date. A division bench of the Bombay High Court held that sales tax dues cannot be recovered from a transferee under Section 38C of the Bombay Sales Tax Act against any property if the same has been legitimately purchased by the transferee without having any notice of the alleged dues of the Sales Tax authorities. The High Court convicted 6 of the ten accused in the Harshad Mehta Scam case also known as the Securities Scam of 1992. Mehta who is said to be the kingpin of the entire scam that broke out in early 1992, died in December 2001 and the case against him was abated in April 2002. The Court held that if someone is not consciously in possession of a live cartridge then it does not amount to an offence under the Arms Act. The bench of Justices VM Kanade and NutanSardessai were hearing a writ petition filed by a woman against whom an FIR was registered after a bullet was found in her bag at the Mumbai International Airport in 2013 when she was travelling from Mumbai to New York. Court has now quashed the FIR against her in this case. The Court recently directed the Bank of Baroda to grant pension to its former employee who served them for 39 years with a retrospective effect of five years along with 9% interest. A division bench of Justice V M Kanade and Justice NutanSardessai of the Court refused permission for loudspeakers at Shivaji Park saying that the Supreme Court and division benches of the High Court have time and again prohibited the use of loud speakers in silent zone. In 2010, Shivaji Park was notified as a silent zone. The Court asked the state government to submit its reply detailing the outer limit for the appointment of an Advocate General. These directions came when the bench of Justices AS Oka and Anuja Prabhu dessai were hearing a petition filed by a Member of the Legislative Council, Sanjay Dutt. The High Court, through its registry directed all lower courts to accept demand drafts and cheques for the purpose of payments of bail bonds. This was notified on November 28, 2016. 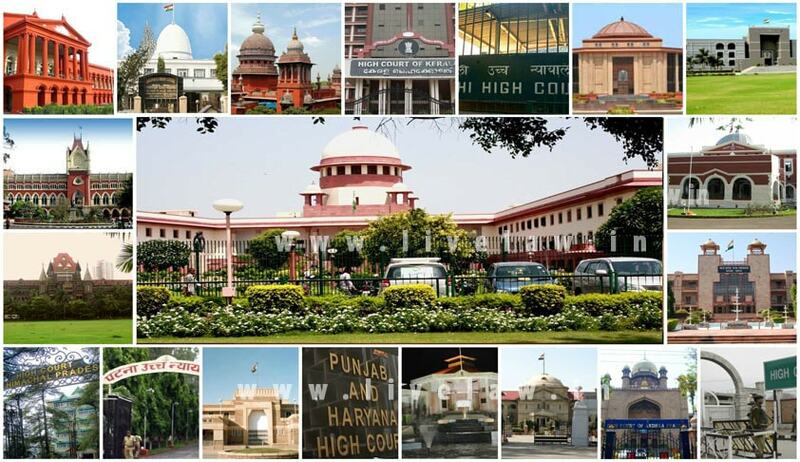 A son can reside in a self-acquired property of his parents so long as they desire and cannot claim a legal right to stay there, irrespective of his marital status, ruled the Delhi High Court in its latest judgment. The High Court on Thursday dismissed a petition seeking quashing of the RBI circular dated November 21. This circular allowed withdrawal of Rs. 2.5 lakh for weddings, however in order to establish that the persons for whom the payment is proposed to be made conditions were imposed under paragraph 2(vi)(c) with regard to the limits of cash withdrawal for the purpose of celebration of wedding. In a landmark judgment with strong repercussions for the government, the High Court on Thursday quashed a Central Government Order (CGO) banning 344 fixed dose combinations (FDCs) of drugs. The High Court dismissed a plea against restriction imposed on cash withdrawal as part of the demonetisation drive, observing that it is a policy decision by the Central government and is beyond the scope of powers of judicial review. In PKS Shrivastava vs. Union Of India And Anr, the Court dealt with the maintainability of a writ petition on the ground as to whether it had the territorial jurisdiction to decide it or not, as the petition was filed against an order of termination of service passed by the Ministry in New Delhi against Shrivastava, who worked as a Director of Goa Shipyard Ltd. The Karnataka High Court in Karnataka Power Transmission Corporation vs. M. Rajashekar, has ruled that courts, tribunals or other authorities shall not ask for ‘no objection’ of the advocate already on record, to accept the vakalatnama filed by a new advocate. The Kerala High Court in Bipin vs. Meera, dealt with the question whether subsistence of the matrimonial relationship is the sine-qua-non for seeking reliefs under the Protection of Women from Domestic Violence Act, 2005 (DV Act). The Madhya Pradesh High Court (Indore bench) in Anil Jain vs. Sunita Jain, said that a wife residing separately from husband without any reason is not entitled for maintenance under Section 125 of CrPC. Dismissing petitions seeking permission to conduct Adal Padal, a vulgar and obscene dance programme conducted during temple festivals in the state, Justice PN Prakash of Madras High Court expressed his ‘anguish’ and ‘regret’ for passing some orders in the past, which helped some groups to coerce police to give permission to such programs. The Orissa High Court in Vinay Gupta vs. Saveri Nayak, dealt with whether passing of an ex parte interim order regarding custody of their child in favour of the opposite party was permissible under Section 23(2) of the PWDV Act or not. The Punjab & Haryana High Court in a recent judgement held that women in Live-In Relationships are entitled to maintenance akin to legally-wedded wives. Highlighting the State’s lack of preparedness and functional ‘paralysis’ in the face of the massive tragedy in the form of flash floods that struck Kedarnath in 2013, the Uttarakhand High Court issued mandatory directives to the State to deal with such exigencies and also to maintain the ecological sanctity of the area. In a bid to take affirmative action over unabated pollution of river Ganga, the High Court issued a set of mandatory directives to be carried out by Central and state authorities. Among others, the high court directed a special audit to be done by the Comptroller and Auditor General (CAG) of all Centrally-financed schemes to check alleged misuse of funds.